Local Friends at Lightcliffe St Matthew’s in West Yorkshire knew there were another twenty gravestones buried somewhere around the old church, but had never been able to locate them. However, during the long dry summer of 2018, the parched ground revealed some welcome finds! 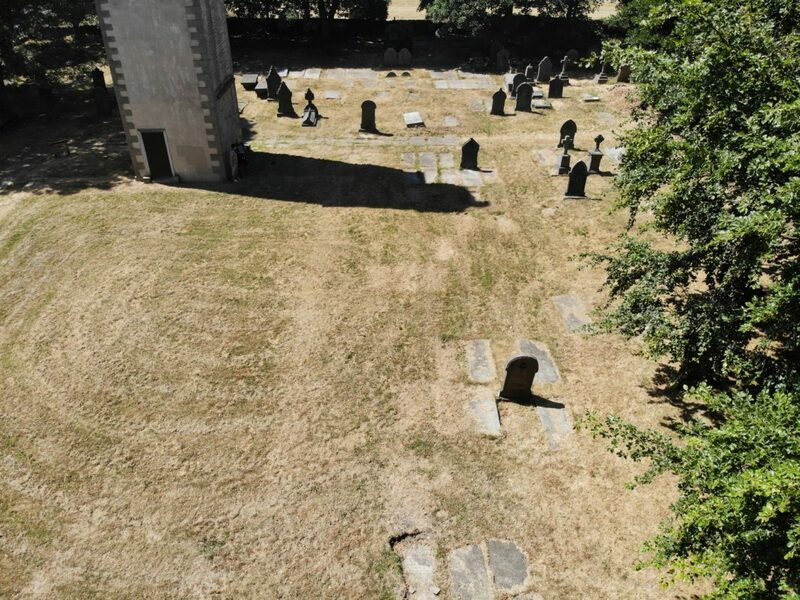 As local friend Gary Edmondson flew his drone over the oldest part of the churchyard, distinct rectangular shapes could be seen – the grass was paler as the roots had only a few centimetres of soil to grow into. With the confidence to dig a little deeper than normal, the Friends uncovered five graves up to 30cm deep and cleared the top soil to reveal, photograph, map and record the stones and their inscriptions. The graves uncovered belong to Bancrofts, Taylors, Petty, Hemmingway, Hepworth, Lumb, Smith, Binns & Hanson – and can be traced on the Friends website. Most of the memorial stones at Lightcliffe were recorded in 1930 by Bradford man, Arthur Blackburn and having found and recorded all but twenty – the next challenge of the Friends is to find the fifteen remaining! They are particular keen to find that of Elizabeth Mallinson, died 1789. She was clearly a paragon of womanhood – inscribed on her stone is a long epitaph “..In mental abilities exceeded few, in industry by none…” and so on for another 8 lines.